Edinburgh has a thriving session music scene, scattered around friendly pubs where traditional folk music is played for pleasure. These sessions attract vibrant souls, young and old, and the music of Scotland, Ireland and Europe is passed on and explored and enjoyed. One such session pub, the now defunct Reverie, had a legendary status for some 8 years as a really good place for tunes, led by the fiddle maestro of Shooglenifty, the late Angus R Grant. I went to this regularly, and enjoyed meeting the many younger musicians who were drawn to Angus and his welcoming wizardry. One evening in 2012, I spotted a fellow receiving a guitar from another guy at the other end of the long session table. The instrument looked amazing, white spruce shining in the darkened pub. So I quickly headed over to find out more and then met the recipient, the hugely talented young guitarist Matheu Watson, and the guitar’s maker, Rory Dowling. I warmed to them immediately, guys passionate about their crafts, and we were soon deep in discussion about guitars, woods and music. Discovering Rory’s passion for the Stefan Sobell school of guitar making, I then invited Rory over to see the two Sobell instruments I have, a 1983 small bodied mandolin in spruce and Indian rosewood, and a 1995 octave mandolin in spruce and Brazilian rosewood, along with a pile of other stringed instruments in the wider mandolin family. This was a revelation to us both, as I learnt all sorts of small new details about my collection, and Rory obviously knew his stuff, and was very taken with the Sobell mandolin, a particularly fine example of Stefan’s luthiery. In further discussion, Rory revealed a keenness to build a mandolin, and mused on the classic F5 style as a start. 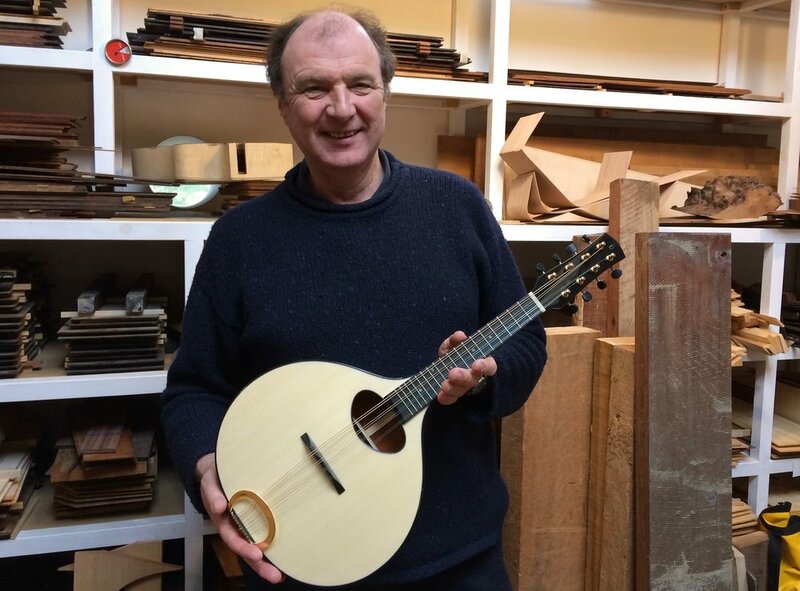 However, I suggested that there were plenty of these being made worldwide and that, in my mind, the gap in the market was for the Sobell style of instrument. I later passed my mandolin on to Rory for a K&K pickup installation and left it with him to study in detail for a few weeks. 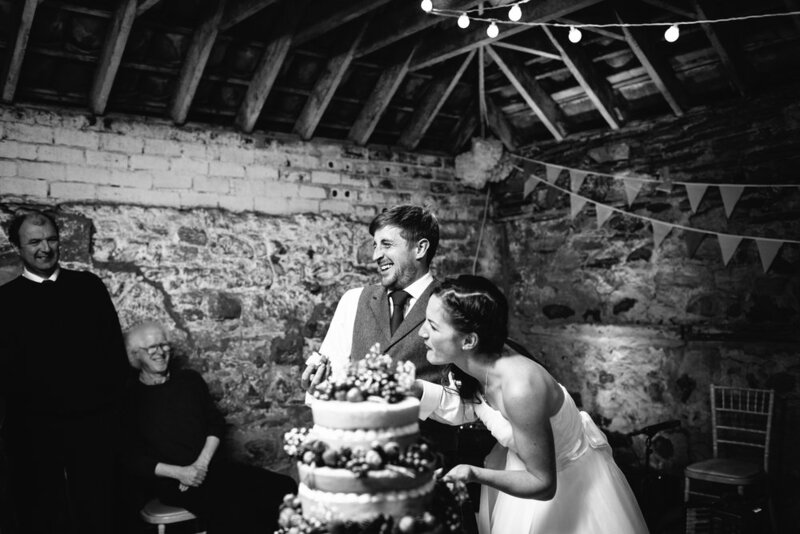 So, I was excited to learn that Rory had then made a prototype mandolin, incidentally in the busy run up to his wedding, a hugely memorable day at which my ceilidh band, The Occasionals were honoured to play. Cake cutting surrounded by amazing friends! The Occasionals absolutely rock it! The party lasted well into the morning! The prototype mandolin was very impressive, below is a video of a few Jigs we recorded in the workshop. Releasing this video over the web drew many favourable comments and, excitingly, several orders for the real thing. Fine tune the ergonomics of the prototype. Through a few discussions between Rory & I, he developed a new style tailpiece to take both loop and ball end strings. A variety of other small tweaks as he refined the design. This including a 14th fret neck joint that allows amazing access and space on the neck. Then, five wonderful completed mandolins appeared from Rory’s amazingly talented hands, mind and heart. Undoubtedly, the major development was the introduction of double laminate sides to the mandolin, obviating the need for inner kerfing, as the back and soundboard can sit straight on the rock solid sides. The laminate was of Indian rosewood, or Mexican cocobolo, or Scottish sycamore tone wood with a inner side of sycamore or lime wood. We then did comparative films of all three wood body types, and, of course, more orders followed, and great feedback from delighted customers too. I, myself, then placed an order late in 2017 for Taran “Springwell” mandolin number 14, and I chose the superb Mexican cocobolo for the back and sides, with lime wood lining reclaimed from the old Smugglers Inn bar top in Anstruther, Swiss spruce soundboard, ebony fretboard, mahogany neck with ebony veneer on the faces of the headstock and the new Rocklite binding. A final flourish was the addition of dot fretmarkers and the Taran “t” logo in hand-cut New Zealand paua shell which Rory had beachcombed on a trip there when he was 18 years old! It is a superb instrument! Gorgeous woods, astounding attention to detail, with multiple subtle juxtapositions of the woods at the neck joint, with a mastery of detail that only a real artist could create. And the sound is full, balanced, punchy with shimmer and ring aplenty, just perfect for my style of Scottish music. So, all in all, a wonderful liaison with such an incredible luthier, and a complete gentleman to work with. A great thrill, and a great addition to the Taran Guitar’s range of world class instruments. I look forward to making music with the mandolin for many years to come.